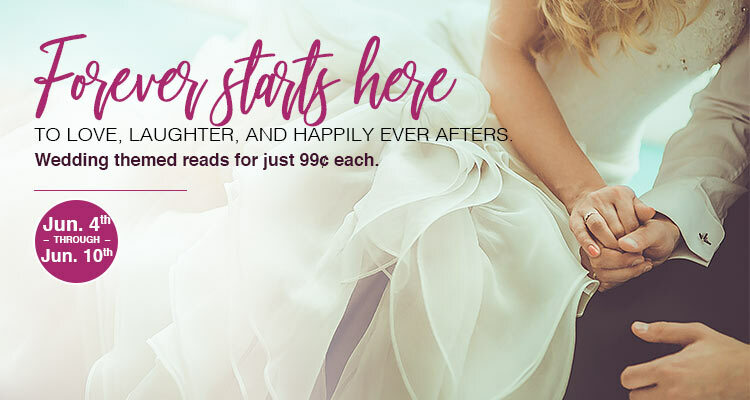 Home » Featured » 13 Wedding Themed Romances on Sale! I am really looking forward to reading The Wedding Hoax. Blame it on the Kiss! Love that cover too! Just Jilted. Thanks for the chance. “Don’t Bite the Bridesmaid” sounds amusing! The Ingrid Hahn book. I love historical romances! 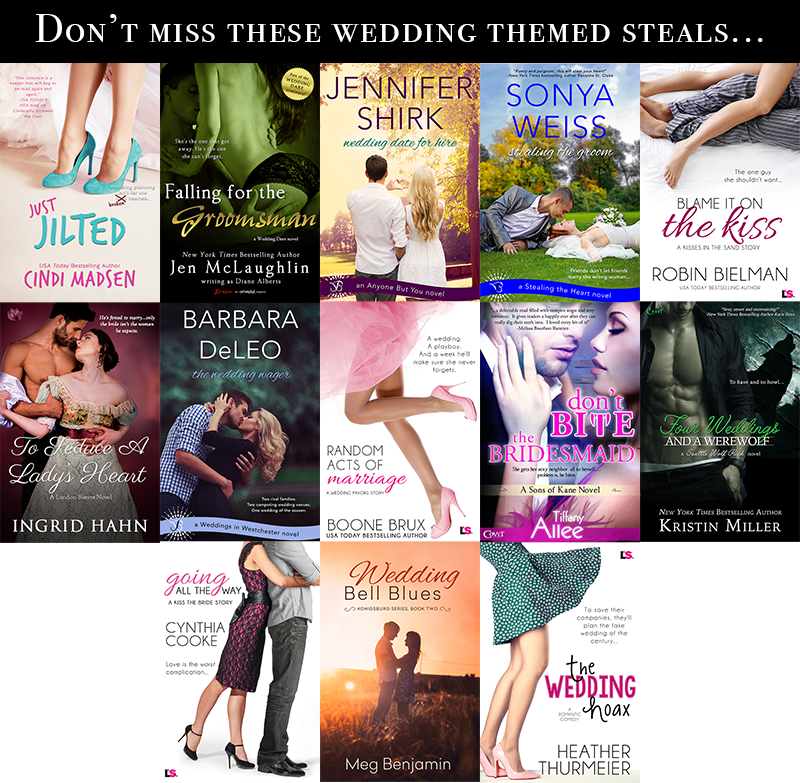 I really, really want them all but I’m going to put Sonya Weiss’ Stealing the Groom as my very top needed book. My daughter is getting married during August so this would be great timing and a lovely surprise! I confess to having read (and reviewed) over half of these books and enjoyed them all! Blame It On The Kiss – Thanks for the chance! Blame it on the Kiss by Robin Bielman! Looking forward to Going All The Way. Sounds really good! Just Jilted sounds like a good read. All of them were intriguing. Just Jilted by Cindi Madsen looks fab! Just Jilted by Cindi Madsen! I think I’m most excited to read Just Jilted by Cindi Madsen. Thank you for the chance <3 So awesome of you all! STEALING THE GROOM sounds like a fun read. To seduce a lady’s heart!!! But they all sound great!! Ty! For the chance!! Shared on all my socials!! I can’t wait to read Wedding Date for Hire by Jennifer Shirk. It’s Blame it on the Kiss. Don’t Bite the Bridesmaid by Tiffany Allee! Just Jilted by Cindi Madsen – so love this author! I want all of them, I love to read and so they all sound good so I can’t wait.. The Wedding Hoax. thank you. I would love to read Blame It on the Kiss. Random Acts of Marriage sounds good. Don’t Bite the Bridesmaid looks fun! Stealing the Groom sounds great. Thanks! Wow! What a great giveaway! I’m most excited about Just Jilted or The Wedding Hoax. If I had to pick one- Just Jilted. thanks for the chance! Loving the cover for The Wedding Wager! Don’t Bite the Bridesmaid sounds right up my alley. Love in the air. June is the month for weddings. We were suppose to pick a book. I would pick Don’t bite the bridesmaid. Looks funny. I’m looking forward to reading “Just Jilted” by Cindi Madsen. Just Jilted sounds like so much fun, thanks for the book sale!